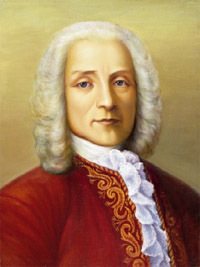 Domenico Scarlatti was one of the ten children of Alessandro Scarlatti, himself a notable opera composer. Domenico grew up in Naples and by the age of 16 had become organist and composer at the Neapolitan Royal chapel. Accompanied by his father, he sought work in Florence before returning to Naples and composing two Neapolitan operas in 1703 and performing a substantial rewrite of Pollarolo's Irene the following year. Scarlatti spent the next four years in Venice, and in 1709 went directly into the service of Maria Casimira, the exiled Polish queen then living m Rome. He composed intensively, producing seven operas for the court, including in 1712 Tetide in Sciro, one of his 70 surviving operas. In 1713 he was appointed Maestro di Cappella to the Basilica Giulia in the Vatican, followed the next year by an appointment to the Portuguese ambassador to the Vatican, the Marquis de Fontes. This succession of posts allowed him to expand his interests in both sacred and secular music. Regular weekly recitals under the auspices of Cardinal Ottoboni, who had already taken Corelli under his wing, gave him the opportunity to meet Corelli and Thomas Roseingrave, an Irishman who later helped spread his fame in England. The Cardinal also introduced Scarlatti to Handel, and arranged a harpsichord-playing contest between the two. In 1719 Scarlatti resigned his position. He spent two years as harpsichordist at the Italian Opera m London, and then went to Lisbon in Portugal, where he became the Mestre to the Patriarchal chapel. He made only a handful of return visits to his native country: one in 1725 to visit his dying father; and another to Rome in 1728 to marry Maria Gentili, aged 16 and some 27 years his junior. Scarlatti finally settled m the employ of the musically gifted daughter of King John V, the Infanta Maria Barbara, and entered an extraordinary period of writing. His two 15-volume collections of sonatas for unaccompanied keyboard, mostly written for the Infanta, contain more than 500 works and established Scarlatti as one of the leading composers for the harpsichord. The Iberian influence is at times evident in these works, revealed in a guitar-like strumming effect achieved by rapid repetition of notes, and the sudden shifts from major to minor. These notoriously difficult pieces require the player to cross hands and play very rapid scales and arpeggios. When the Infanta moved to Madrid, Scarlatti with his wife and five children moved as part of her court, and he eventually became Maestro de Camara in 1746. Such loyalty to his daughter impressed Kingjohn, who sponsored Scarlatti in his application to become a Knight of the Order of Santiago. Scarlatti's move to the Iberian Peninsula was a significant event for the development of keyboard music. The Neapolitan style at that time, based around opera, was very limiting. Scarlatti, by moving away from this tendency, allowed himself a greater degree of experimentation and freedom to develop a wholly new form and style of keyboard composition.